Potholes you can fall into: Have you seen worse? 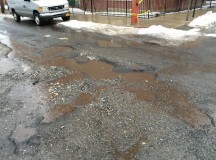 Tweet your pothole photos to @BoroughBuzz and tell us the cross streets where it was taken. Westerleigh, Staten Island — Svetlana Oleynik, a 22-year-old from Staten Island, was about to drive to work one February morning when she noticed something wrong with her MINI Cooper. The tire had a 4-inch bubble from a pothole she hit during her evening commute two days earlier. “I thought, ‘How much is this going to cost me?’” said Oleynik, who ended up paying $300 to replace the flat tire, which included a discount she received as a nurse. Extreme winter weather has taken a toll on the city’s roads and vehicles this year, boosting business for local auto repair shops at the cost of drivers. It’s been particularly tough on Staten Island drivers. 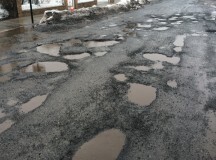 Potholes may be unavoidable in Staten Island, but there are things drivers can do to minimize the damage. Avoiding potholes is always the safest course of action. But if you can’t, drive carefully over them instead of slamming on the brakes. Temperature fluctuations can lower the air pressure in your tires and increase the risk of a flat. Vehicle owner’s manuals have maintenance instructions for regular and severe driving conditions. Staten Island roads are considered severe, and drivers should service their cars accordingly. 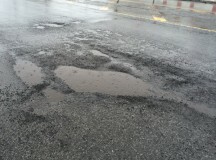 Potholes can be reported online to the Department of Transportation. They must be at least 3 inches deep and 12 feet wide in order to be eligible for repair. Cave-ins, or deep holes without a solid bottom, must be reported separately by calling 311 or filing a complaint online. In the end, street complaints are self-reported, so the severity of deteriorated roads is subjective until they are inspected by the Department of Transportation. Since the snow started falling this winter, Zaloom’s Auto Repair has made wheel and front-end suspension repairs that range in cost from $5,000 to $12,000 and the shop has sold more than 40 tires; all from accidents on a one-mile stretch of Victory Boulevard, near the College of Staten Island. Tire sales bring the biggest increase in revenue, say auto repair shop owners. Sales may be up, but cash flow is slow for these shops. When the weather is bad, mechanics report, clients reschedule their regular maintenance and the overtime costs for emergency repairs can add up. “I’m not worried because people have to get their car repaired or serviced, so that money will come in sooner or later,” said George Zaloom, owner of Zaloom’s Auto Repair. The unexpected costs are too high for some customers who try to negotiate payment plans, according to Zaloom’s Magee, whose shop caters to students. Others are left without vehicles until they can afford the repairs. Drivers struggling with costly repairs can file a property damage claim with the city comptroller. About 1,200 claims were filed citywide in 2012. Most insurance companies will also help drivers with full coverage pay for the damages, but it could increase premiums. Over 15,500 potholes on Staten Island have been repaired so far this year, compared to more than 136,400 citywide, according to the Department of Transportation. 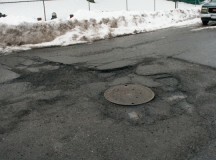 Still, there are nearly 1,300 unresolved street complaints in Staten Island, which can include cave-ins, potholes, wear and tear and overall bad conditions, according to recent 311 data. 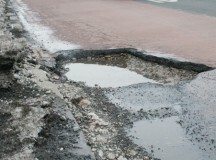 The Department of Transportation did not immediately say when it expects the potholes to be fixed or the complaints resolved. “Our roads are always pretty bad,” said Paul Buckheit of All Tire Company. “It leads to some unsavory conditions.” But it’s worse, say many in the business, when it snows since drivers can’t see the potholes easily. Kevin Romero, a 22-year-old student at the College of Staten Island, had two damaged tires in as many days from hitting potholes. A series of potholes on School Road took out the rim of Romero’s front-right wheel on his way home at night.